Today, of course, marks the third anniversary of the multiple suicide bombings in central London, in which more than 50 people died. It was seen at the time as a seismic, defining event, that would re-write the social contract and had the potential to bring in its wake civil strife, paranoia and a wartime mentality not seen since the days of World War II. So, what has changed in the past three years? In some ways, surprisingly little. Rather than being, as many feared at the time, the beginning of a major escalation of terrorism in the UK, it turned out to be (as 9/11 itself did) something of a freak event. True, there have been plots and rumours of plots. There have been arrests. 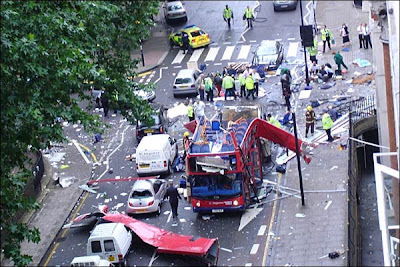 There have been alarming reports from the police and the security services about the number of suspected terrorists in the UK (2000 and counting); and there have been a number of botched and abortive incidents in which thankfully no-one (except sometimes the bomber) has been hurt. In retrospect, indeed, 7/7 can be seen as the last (at least for the moment) of a number of "spectaculars" aimed at Western targets, beginning on September 11 2001 and continuing in Bali and Madrid. Its originators were largely self-funded and self-sustaining. They were luckier than their would-be emulators have been, but also much better organised. We have not seen their like again. Islamist terrorism has continued, of course: above all (though decreasingly) in Iraq, elsewhere in the Middle East, in south-east Asia, in Pakistan, increasingly in Afghanistan. Today has, by awful coincidence, seen a particularly heinous attack on the Indian embassy in Kabul, in which at least 41 died and scores more were injured. There are many reasons why terrorist acts occur there rather than here. Terrorist networks are better organised and longer established; they have more anger and more desperation to draw upon; the issues are much more immediate. Terrorist plots in Britain, and elsewhere in the west, are not really home-grown, even though their perpetrators are. They represent, rather, an overspill from the politics of the Islamic world, the remnants of a Carribean hurricane that crosses the Atlantic and blows down a few trees in southern England. While the government has seized the opportunity to press ahead with ever-more-draconian terrorist legislation in the years since 2005, the British public as a whole has largely declined to be spooked. There has been some talk of "Islamophobia" - largely from the Muslim Council of Britain and its fellow travellers on The Guardian - but little evidence of a backlash against Muslims. The BNP has, it's true, done its best to exploit public fear and seen its once negligible vote increase in some areas. But its popularity remains far less than that achieved by equivalent parties on the continent. And the positive reaction to David Davis's decision to resign his seat in protest at New Labour's terror laws shows what may prove to be a significant swing back in the direction of liberty. There is, on balance, reason to be optimistic. Things could have turned out a lot worse. To accompany a Dispatches documentary to be shown tonight - in which Peter Oborne argues, implausibly, the Britain has become an Islamophobic swamp - Channel 4 commissioned a report (pdf) from Cardiff School of Journalism on the representation of Muslims in the British media (specifically, in newspapers). Despite a clear ideological bias - the authors state that their analysis "follows on from Edward Said’s well-known work on ‘orientalism’" - most of the report's findings are predictable to the point of banality. They discovered that stories about Islam in Britain concentrated on terrorist trials and arrests, perceived cultural differences between Muslims and the wider population, and "extremism". They noted that the Rowan Williams speech on Sharia law had received widespread, and largely negative, coverage; and that the comments by the bishop of Rochester, Michael Nazir-Ali, about Muslim "no-go" areas had been much more favourably received. They analysed the adjectives used to describe individual Muslims in press reports and discovered that among the most common were "extremist", "radical" and "fundamentalist". They concluded from this that much of the coverage was "negative". Our findings suggest that the coverage of British Muslims has increased significantly since 2000, peaking in 2006, and remaining at high levels in 2007 and 2008. This rise is partly explained by the increase in coverage devoted to terrorism and terrorism related stories - 36% of stories about British Muslims overall are about terrorism. This is especially notable after the terrorist attacks in the US and the UK in 2001 and 2005. In recent years, however, we have seen the increasing importance of stories focusing on religious and cultural differences between Islam and British culture or the West in general (22% of stories overall) or Islamic extremism (11% overall). Indeed, 2008 was the first year in which the volume of stories about religious and cultural differences (32% of stories by 2008) overtook terrorism related stories (27% by 2008). The most obvious explanation for this is that there are fewer terrorism stories to cover. But there are also far more culture-clash stories around than there used to be. Over the past couple of years we've seen (to mention only the most obvious stories) the Jack Straw-inspired veils debate, the Pope's speech at Regensberg, Fitna, Salman Rushdie's knighthood, the Williams/ Nazir-Ali duel, above all the Danish cartoons crisis. And along with these, like the drolleries in the margins of an illuminated manuscript, come all the silly season stories about Muslims "taking offence" at Christman decorations, or piggy banks, or police sniffer dogs, stories which can generally be traced back to self-publicising local councillors, or self-appointed "community leaders", or, overwhelmingly often, well-meaning but dunderheaded white liberals and professional "diversity advisers" seeking to justify their bloated salaries. Some of these stories represent more or less random news fashions. Thus last week's "puppy postcard" story came a few days after a story about claimed religious objections to sniffer dogs - a story which itself came back, a couple of days ago, in the form of ACPO guidelines bizarrely suggesting that such dogs might be issued with rubber shoes when searching Muslim properties. This may have been coincidence; or perhaps it was reading the sniffer-dogs story that got Councillor Asif thinking about the "offensive" postcard. But there is, I suspect, something deeper at work, a real change of emphasis in the "clash of civilisations". Terrorism is now seen, on both sides, as a side-issue; the real territory being fought over is cultural. In the wake of the cartoons crisis, which was in many ways a stage-managed event, the Organisation of Islamic Conference (acting through the UN Human Rights commission) has been waging a campaign to make criticism of Islam some sort of international crime. Organisations such as the Muslim Council of Britain have become more vociferous, more overtly political and more scrutinised. Meanwhile, the media spotlight (lit by the threat of terrorism) has begun shining on parts of the British Muslim community that had hitherto been little noticed or explored. Muslims have been asked their views, and surprisingly large minorities have voiced support for Sharia law or even the political aims of terrorist groups. Government drives to encourage social cohesion, prompted by terrorism and fears of radicalisation, have brought to light other issues, such as the hitherto largely ignored suffering of forced marriage. So that what began as a focus on a particular threat has come to seem altogether more nebulous, but also more pervasive. A survey (pdf) commissioned for the Channel 4 programme did not, however, discover much evidence of fear or loathing on either side. A mere 17% of non-Muslims admitted to feeling "more uncomfortable" in the presence of Muslims since 7/7, and only a quarter of those described the feeling as one of hostility. Similarly, only a quarter (and 13% of Muslims) believed that the presence of Muslims in Britain amounted to "a security threat", despite the strict illogicality of such a denial (after all, the presence of some Muslims in Britain undoubtedly is a security threat, and the absence of all Muslims would entail the absence of the threatening ones). And a clear majority thought that Muslims in Britain were subjected to unjustified criticism. Most people, despite everything, are still generally tolerant. That's not what the commentary said, of course. But then the truth would have made for boring television. Amazing - a balanced and informed opinion, instead of the hastily concocted, partisan tosh I read in the 'quality' press. Well done. Yes, the absence of a real backlash is heartening. Compare modern attitudes to kicking dachsunds and banning Beethoven in WW1 and we have, it seems, made progress. I was picknicking yesterday in Russell Square after being at the wonderful George MacDonald Fraser memorial service in Smith Square and pondering - as one must - the carnage pictured above. What is fear, what really frightens people? I was recently arguing in the Cif Boglands that a large and almost wholly undiscussed fear among some Muslim communities is the fear of Muslim criminal gangs - anyone who doubts this should google Mohammed Sarwar and gangsters. And while there are plenty of answers being given to questions, what the answers mean is pretty mysterious. has 77% of Irish Muslims saying they feel accepted in Ireland which is nice but 37% also wanting Ireland to be run as an Islamic state which is not nice. One Irish commentator poinrted out that ihe poll as a whole seems to show that Irish Muslims are more integrated than British and American Muslims, yet keener on islamic law. We keep saying these polls don't prove much and I can't take them too seriously myself but Muslim 'satsfaction' seems to be consistently at least as high or maybe higher in Britain than in European countries that haven't been invading Iraq and Afghanistan. What does it mean? I don't know, but we all must read our Flashmans. As a wise man said, Bush and Blair should have been forced to read the Flashman novels.